John E. Boyle was born in 1956 and has been a fan of Robert E. Howard for half a century. After earning two degrees and serving time in the US Forest Service, retail, IT and the teaching profession, he has capped a sordid career by becoming a caregiver and writer in Philadelphia, PA. He has written two novels: Queen’s Heir and Raven’s Blood, fantasies set at the end of the Bronze Age in a world where Atlantis was real. I consider REH to be one of the greatest fantasists of all time and I am not alone. I have admired and been inspired by both his prose and his poetry but I also appreciate where his writings have led me. If I had never read Howard, I might never have read the horror of Clark Ashton Smith, the histories of Harold Lamb or the adventures shrouded in the mysteries of the East penned by Talbot Mundy. If you take a look at the books listed in Robert E. Howard’s personal library, you will find thirteen works by Talbot Mundy, so I think I can say that he was an influence on REH. I think that influence on Howard’s work is most clearly seen in the stories of El Borak, the Texas gunfighter who becomes an adventurer in Central Asia, and in the setting and many of the characters in his story The People of the Black Circle. I know I’m in good company when I say that I enjoy the stories written by Talbot Mundy, but like many writers popular in the first half of the 20th century, he is almost unknown today. So, who was he? Born William Lancaster Gribbon in London in 1879, Talbot Mundy had a checkered early career that took him from England to India to Cape Town to Australia to the Portuguese, British and German colonies in East Africa. He returned to England on occasion but didn’t start to write until he came to the United States; after he achieved some success as a writer, he still traveled extensively across the US and found time to visit the Mayan ruins in Yucatan and spend a year in Egypt and Jerusalem setting up and running a newspaper. During his travels, Mundy may or may not have worked for British Intelligence, may or may not have met one or more intelligence agents who became the inspiration for his Jimgrim/Ramsden characters, may or may not have met Kipling, T.H. Lawrence and Chesterton during their travels and spoken with them about writing or Eastern philosophy. It is hard to say because Mundy admitted that he had been a bald-faced liar in his youth but we do know that he was involved in ivory-poaching during his time in East Africa. When Talbot Mundy wrote of the rough, hard crowd you might find along the East African docks or the alleys of Peshawar, there is reason to believe he was writing from personal experience. Mundy wrote a great many stories for Adventure magazine, which founded the famed Adventurer’s Club in 1912; he was one of the original members, joining the varied collection of writers, hunters, explorers and military men who filled its ranks. William L. Gribbon had been born into the Anglican church but became interested in the Christian Science movement in 1918, after becoming a naturalized citizen of the US the previous year. After becoming close friends with at least one leading member of that group, Talbot Mundy agreed to travel to Palestine and help the Christian Science Society establish and run the Jerusalem News, the first English language newspaper in that city. He traveled by way of London, Rome, Alexandria and then to Jerusalem where he helped get the newspaper up and running. While in Palestine, he was a witness to the Nebi Musa riots and was able to visit the Great Pyramid of Giza, where he said he spent a night alone in the King’s Chamber. Back in the United States in 1920, Mundy used his experiences in the Middle East as inspiration for a new character called James Grim, known as Jimgrim, and his companions Jeff Ramsden, Narayan Singh and Chullunder Ghose. Their adventures in more than a dozen novels spanned the roaring ‘20s and may have been a partial inspiration for the deeds of Doc Savage and his Fabulous Five. At the same time, Mundy found himself growing distant from the Christian Science movement and in 1923 he abandoned Christian Science to join the Theosophical Society of Pasadena. He embraced the form of Theosophy influenced by Helena Blavatsky so completely that he came to be recognized as one of that Society’s most popular and charismatic public speakers; the principles of Theosophy (which influenced REH as well) had an immense impact on Talbot Mundy’s writing for the rest of his life. While Mundy was influenced by both H. Rider Haggard and Rudyard Kipling, he was by no means their clone. He wrote more than one book about the courage and sacrifices of Indian soldiers on the Western Front in World War I, and he was one of the first novelists to write about the Turkish persecution of the Armenian people. Unlike Haggard and Kipling, Talbot Mundy’s stories often depicted resistance to the encroachment of empires; he has sometimes been referred to as anti-colonialist and some critics accused him of an anti-British bias in his writing. These characteristics and Mundy’s expression of a positive interest in Asian religion and philosophy gave his stories their own atmosphere. Talbot Mundy started selling stories to the pulps in 1911 and continued to do so until 1935, and then wrote several novels and more than 700 scripts for the Jack Armstrong, the All-American Boy radio show. It is impossible to discuss every one of his non-fiction articles, his short stories or his novels, so I would like to focus on his three most famous literary creations: King, of the Khyber Rifles, his Tros of Samothrace books and the Jimgrim/Ramsden series. King, of the Khyber Rifles was published in 1916, first as a serial and then as a hardcover book, to critical acclaim that often compared the author to Haggard and Kipling. It is a contemporary tale of adventure and intrigue set against the backdrop of the North-West Frontier of India during WWI. It is fiercely pro-Ally and features Athelstan King of the British India Secret Service and the Hindu adventuress Yasmini (who appear in other books by this author) in their attempt to prevent a German-backed jihad from breaking out against the British Raj. While this book does not have the polish of his later novels, Mundy’s energetic blend of adventure, intrigue, fantasy and Eastern mysticism makes for an entertaining read and has influenced other writers down to the present day (see S.M. Stirling’s The Peshawar Lancers). If you can get a copy of this book with any of the original drawings by Joseph Clement Coll, I would recommend that you do so. J.C. Coll was a genius who died too young. Tros of Samothrace first saw print in the pages of Adventure magazine in 1925 and constituted a series of stories that were eventually collected into three books: Tros of Samothrace, Queen Cleopatra and the Purple Pirate. Unlike Mundy’s previous work, these were not contemporary stories but historical fiction set in the time of Julius Caesar and Cleopatra at the end of the Roman Republic. Fantastic elements were kept to a minimum but the author used the Druids, Samothracian philosophers and Egyptian savants as a means of presenting the “Ancient Wisdom” religion that was part of Theosophy. Packed with chariot races, gladiatorial combats, naval battles, political intrigue and a touch of romance, the Tros books are my favorite novels by Talbot Mundy. Considered too wordy by some and criticized by several historians at the time they were written (Mundy’s portrayal of Julius Caesar was considered too negative), these books are still great reads today and quite enjoyable. Recommended. 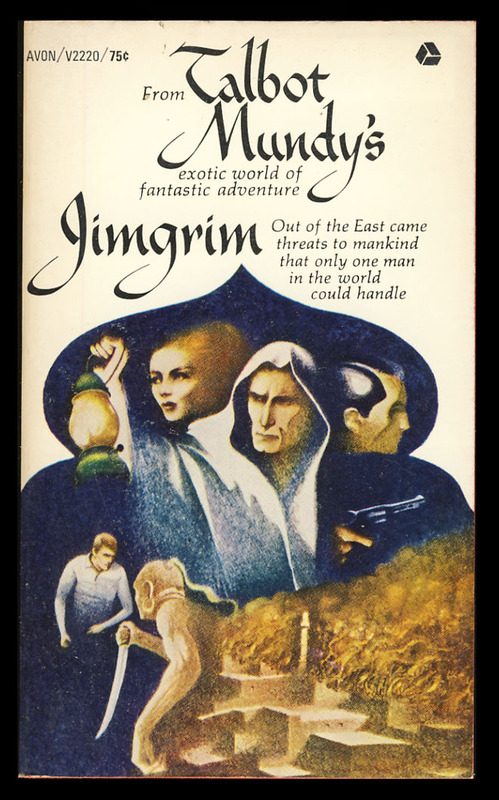 The Jimgrim/Ramsden series of novels are the books by Talbot Mundy that are of most interest to fans of science fiction. According to the international treasure house of Roy Glashan, there are seventeen stories in this series, all written between 1921 and 1930. They describe the adventures of James Grim (an American adventurer employed by the British Secret Service), Jeff Ramsden (an American engineer who often narrates the stories) and their companions in a series of adventures across the Middle East and Asia that set them against various mystics, madmen and secret societies who possess or seek the lost knowledge of the Ancients (and power, of course). Mundy used a number of concepts in these stories that were fantastic for the time, but which have become more common in SF in the years since, including antigravity, Atlantean and Egyptian super science, atomic energy, hypnotism, strange drugs, psionics, vibration and energy weapons, dimensional travel, super human mahatmas and the transmutation of elements. OM: The Secret of Ahbor Valley is probably the best known of these books, but there are plenty to choose from. Talbot Mundy is sometimes criticized as too wordy but he used those words to provide narrative structure and vivid characterization. His approach to SF was grounded in his experience in adventure fiction; it featured tight, complex plotting, exotic locations (many of which he had visited himself) and an emphasis on honor, loyalty and spiritual development.In a career spanning nearly thirty years, his writing could be uneven at times but at his best he was a skilled writer who authored some of the best Oriental adventure stories to see print in the Pulp era.I recommend taking a look at his work; you won’t regret it.